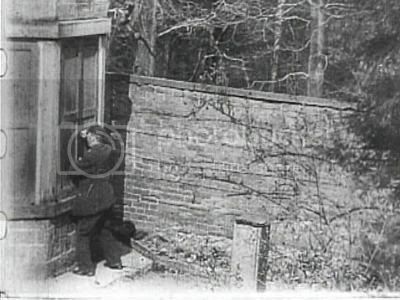 Made with the assistance of the Sheffield Fire Brigade, 'Daring Daylight Burglary' was a big commercial success when it was released in 1903, Charles Urban paid £50 for sales rights in the UK and the Edison Company in the USA distributed it (under the name 'Daylight Robbery', and is believed to have been the inspiration for 'The Great Train Robbery'). 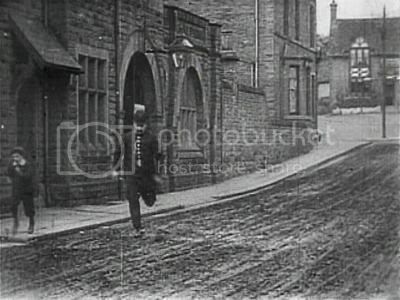 It was produced by the Sheffield Photographic Company, as the name suggests a photographic business, operating in Norfol Street, Sheffield. 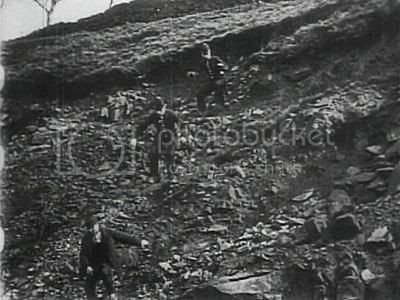 The eldest son of the family spent a year working for famous producer RW Paul, and on his return made films for the Sheffield Photographic Company. 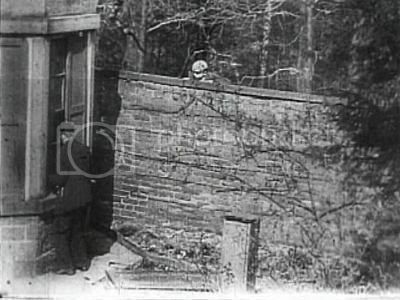 The film starts with a burglar climbing over a wall and breaking into a large house. A small boy sees the burglar doing so, and runs to the Police Station, with the Police then running to the house. 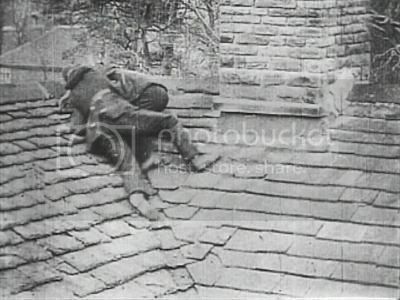 After the Police enter the house, the burglar is seen on the roof where he is caught by a Policeman. They fight, and the policeman is subdued and then thrown from the rooftop onto the street below, where he is shown lying unconscious, possibly dead. Another Policeman goes to his rescue and places him into a horse-drawn ambulance. The chase for the burglar continues, and after being caught again, subdues yet another Policeman, and is chased down a rocky hillside and then across a stream. 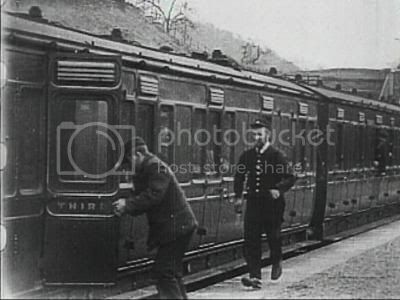 The burglar arrives at a railway station and jumps into a carriage just as a train is departing. 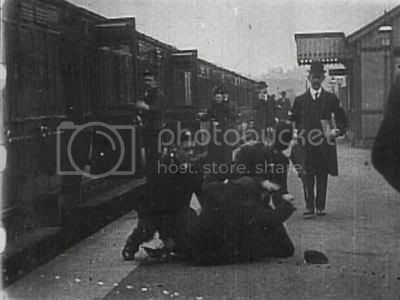 The chase appears to be over, however at the next station, the Police are waiting for him, presumably having been telegraphed from the previous station, and the burglar is subdued and arrested by a Policeman with the help of a young railway worker. The burglar is then led away in handcuffs. Great little film - very realistic and both evocative of the era yet eerily modern as well. How fascinating! Seriously, it's a story that people can understand today despite it being over a hundred years old. Theft still exists in this world, along with the same cast of cops and robbers, albeit the ways are a little bit different this day and age. 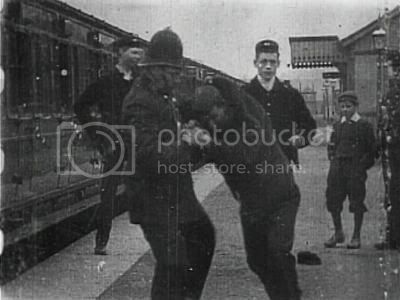 Yes, it's interesting to see how police are portrayed in early cinema in one extreme or the other - either heroes, as in this film, or blundering comedy characters like in 'The Unfortunate Policeman' of 1905 by RW Paul.